Thiruvallur is one of the 108 divyadesams situated near Chennai in the Chennai Arakonam rail route, and about 7 kms from the Tiruvallur railway station. This Kshetram is also called as Thiru Evvul. It is said that once saint Saalihothrar from Badrinath,Tiruvathirai Ashram came down to South to worship Lord Narayanan and attain Paramapadham (heavenly abode). He took a holy dip in Hiruthaapanasana Theertham(Holy Pond) and started meditating for one year. He daily collected some rice and after a year of fasting, he collected about 3 measures of rice. He cooked and offered some portion of the rice as Naivedhyam(offering) to the Lord and he kept the rest of the rice for himself to eat. He waited for some adhithi (a Guest) to come, so that he can offer them something to eat and finish the fasting. At that time Lord Narayanan came there as an old sage, with a jug (Kamandalam) in this right hand and a palm umbrella in his left hand. He appeared to be very hungry and thirsty and as if he had travelled a long way. On seeing him, Saalihothirar greeted him and made him to sit and offered a part of cooked rice. But, the old sage wanted all of the rice to eat. Saalihothirar gave all of the food to the old sage. After consuming the entire food, he asked for a place where he could to sleep ? ( Evvullil Urangalam ?) (Vul - means a place inside) Saalihothirar asked him that he can sleep in his hut itself . The sage slept keeping his head along the south direction and it this Kidantha kolam (Resting Posture) the Lord Narayanan is giving his seva in this sthalam. Since he asked Salihothirar that in which place (Vul) he can take rest, the name of this sthalam is called "Evvulor" or "Thiru Evvuloor". The temple is under the administration of Ahobila Mutt. It has five tiered Rajagopuram (main gate) built by Pallavas. There are separate shrines for Kanakavalli, Ganesha, Alwars, Gajalakshmi Thayaar. There are also shrines to Ganesha, Krishna, NammazhwAr, Chakrattazhwar,Andaal, Vedanta Desikan, Ramanujar, and Lakshmi Narasimhar. There are inscriptions dating back to the the 9th century Pallava dynasty who reigned here. It is beleived that the temple is around 5000 years old. Lord Vishnu as Veera Raghavar is the presiding deity of the Veera Raghavar temple. The Lord is known as Vaidya Veera Raghavar,as devotees come here to be cured of their ailments.In this temple people offer small metal sheets resembling a specific human organ engraved on them as a request to God to cure the illness or problems of those organs. It is believed that those suffering from incurable diseases are cured if they visit the Lord for three new moon days (amavasai). The Moolavar Shree Veera Raghava Perumal is in lying posture(kidanthan),facing the east on a dais at an elevation of 15 feet. His right hand is on the head of the sage Salihotra and left hand in gnana mudra pose preaches to Brahma. Prakthyaksham for Salihothra Munivar. Thaayar : Kanakavalli (Vasumathi thaayar). There is a seperate sannadhi for Thaayar. The temple is revered by the verses of Thirumangai Alwar and Thirumazhisai Alwar. Pushkarani ( holy tank) Hruthapapa Nasini, which is said to cure mental illness. 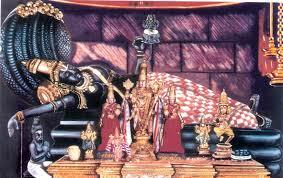 Temple location is in the town of Tiruvallur. How to reach? This place is 4 kms from Tiruvallur station which itself can be easily accessed by suburban trains from Chennai Moore market station and buses. Plenty of local buses, taxis , autos are available from Tiruvallur station. If you are driving from Chennai, it is around 45 kms on NH 205. Where to Stay? There are many star hotels in Chennai and a few and semi deluxe and budget hotels in Tiruvallur town. 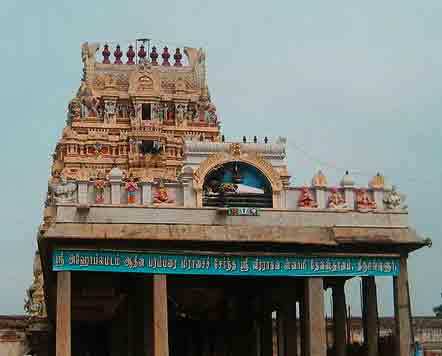 Contact Sri Veera Raghava Swami Temple, Tiruvallur-602 001. Best Season: Throughout the year. Weather: Throughout the year. Summer( from May to July) could be very sultry when the mercury shoots to 40 degree celsius.